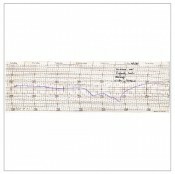 We stock and can supply a wide range of charts for barographs and similar recording instruments. Ungummed charts are for use with clocks with a chart clamp and gummed charts are for use with clocks without a chart clamp. Charts for 7-day rotation are supplied in 100 chart pack. They are available for different barometric ranges and start dates. Our monthly rotation chart is supplied in a pack of 13 charts. All prices include VAT and postage and packing for delivery to addresses with UK postcodes (including the Channel Islands). For delivery to other addresses, please contact us for a quotation for delivery costs. As well as charts for our own instruments, we can supply charts to for instruments manufactured by Negretti & Zambra, Short & Mason, Gradko, Sewills, Darton, Lizars, Metcheck, Rapport, Barigo, Fischer, Carl Zeiss, VFB, Chadburn, Lufft, Naudet, Maxant and the Met Office. Full details of all our charts can be found in the following table. When you have found the reference number for the chart you want to order - in the red column - scroll down to the bottom of the page where all the products are listed and click on the relevant product. You can then complete your purchase.